I know it's $200,000... I just really want one. Guess it's time to start saving. The Weather has been great in Seattle. I went and took this picture Sunday evening of the Sunset (as I saw it from Renton.) it was a great weekend. Jaani and I went to both the Marrymoor dog park and the Renton dog park. Plus, Jaani met a little French Bulldog to play with.. .as well as Otis, my friends Pitt Bull, was there too. They had fun running around and getting tired. It was fun. Lately I've started my T-SQL class, and it's going well. The instructor wrote the text book we are using, and that has proven useful in the class. Other than that, I've been working pretty hard. We lost a team member, because he found a full time job at another company, which means that myself and the only remaining member of our team are the only ones left to run the test passes. I guess it's a lot of work, but at least it keeps me occupied. I also noticed how everyone seems to be freaking out about the Swine Flu. At least it's all over the news. I looked at Google Trends, and found that everyone is searching for flu related web sites. Looking for at home treatments and countermeasures. 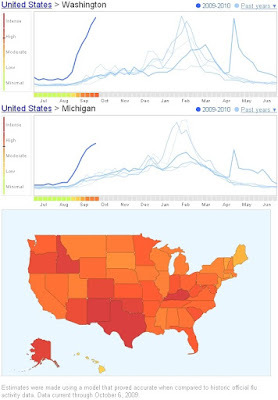 As you can see, both Michigan and Washington have recently started to spike with Flu related web activity recently, but I think most of this is going to be related to the new vaccines that were released. So, people are trying to learn what they can. This data is available before the CDC is able to come up with their own statistics, based on people who go to the doctor and are diagnosed, however it is usually within the acceptable error rate allowed by the CDC statistics. In other words, the CDC usually comes up with about the same numbers as Google for these sorts of things. 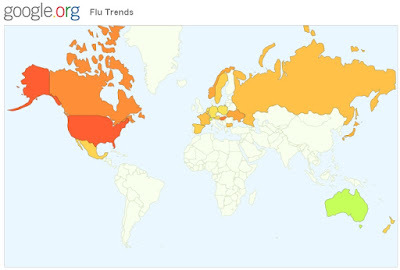 World Flu Trends suggest that Flu related web traffic is highest in the US. Google recently just began tracking these trends in other countries. As you can see, all of North America is at Merderate to High risk for the flu. The thing that worries me, is that normally the Flu risk isn't this high until January or February, and the risk in the past few years has been the highest recorded. With the exception of 1919. Anyway... I'm not sure that this means you need to worry about getting the flu any more than normal, but in general more people are getting sick. This current spike may turn out to be just a media frenzy influencing web traffic, but at the same time, we could be on the verge of a real pandemic. Who knows. Anyway... just some food for thought. It would be fun to walk around with a group of 2000 people doing the same thing.